Ten finalists took the stage on Wednesday, November 7 to compete at the Big Launch Challenge held in Danville, VA. In its fifth year, the Big Launch Challenge has received 218 applications, awarded $119,000 to 12 companies since its inception. The finalists were given twelve minutes to present their business to a panel of judges followed by a short question and answer block. The competition kicked off at 10:00am with an opening welcome from Eva Doss, President & CEO of The Launch Place, and Luke Marshall, Cofounder & CEO of VitalFlo. 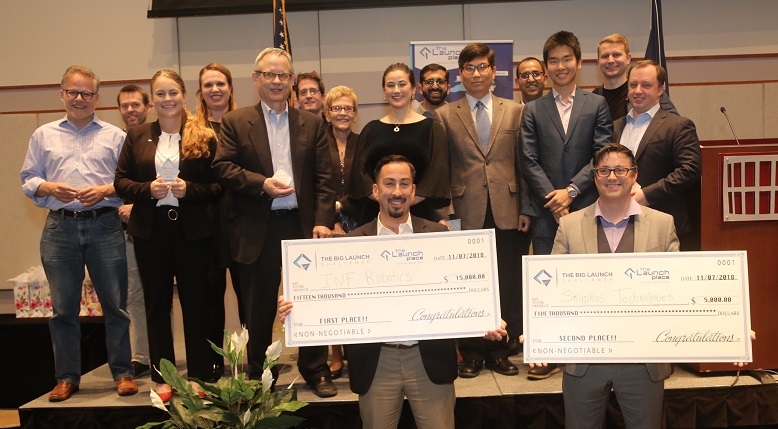 VitalFlo, a lung health analytics platform with a patent-pending mobile spirometer, was the winner of last year’s competition and has since received a $75,000 investment from The Launch Place. The goal of the Big Launch Challenge is to provide early-stage startups the opportunity to pitch their ideas to investors, and for The Launch Place Pre-Seed and Seed Fund to generate deal flow. This year, Paul Singh, founder of Disruption Corporation and serial investor in 2,600+ companies, was the keynote speaker for the event and joined the panel of judges. With his startup background and vast corporate experience, Singh shared his unique insights to competitors and audience members throughout the competition. Paul was in Danville from November 6-8, as part of his American Tech Tour, meeting with entrepreneurs, community leaders and established businesses. The full panel of judges included Paul Clark, Managing Director, VentureSouth; Jan Davis, Retired CEO, ShopperTrak RCT Corporation; Investor, Triangle Angel Partners; Board Chair, The Launch Place Seed Fund; and Entrepreneur in Residence; Paul Nolde, Director, NRV; Paul Singh, Serial Entrepreneur, Investor, Airstreamer, & Disruptor; and Autumn Visser, Principal, Woods Rogers, PLC. The challenge is an annual event and offers startups valuable business networking and capital opportunities, as well as critical resources. The goal of The Big Launch Challenge is to foster entrepreneurship by offering education, team creation, mentorship, early-stage prototyping, and potential follow-on seed financing.